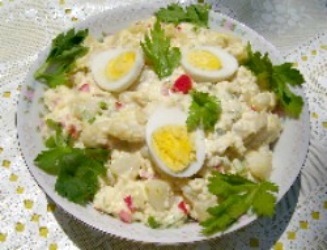 Potato Salad Recipe is an old fashioned potato salad with mayonnaise, mustard, eggs, pickles, vegetables and vinegar. Potatoes are valuable in meal planning because they can be prepared in a myriad of ways; baked, boiled, roasted, or grilled for salads, sides or soups. They are commercially grown in every state in the USA making them plentiful for all seasons. Bring water and salt to a boil in a large saucepan. Stir in potatoes and bring back to a boil. To prepare dressing, put the mayonnaise in a small mixing bowl. Add chopped eggs, pickles, pickle juice, bell peppers, vinegar, and mustard. Mix all together. Salad may be served immediately or chilled in the refrigerator for a few hours or overnight. When ready to serve, place a lettuce leaf in the center of a salad plate, spoon the salad on top and garnish with sliced tomatoes, if desired. This Potato Salad Recipe goes well with Baked Ham, Baked or Roasted Chicken and Turkey. It goes especially well with our bbq Chicken Recipe. There are many versions of old fashioned potato salad. Most contain the same basic ingredients of cooked potatoes, mayonnaise dressing, pickles, onion, and eggs. There is usually a predominate ingredient such as pickles, celery, or mustard, etc. I have never liked a lot of mustard in my potato salad except for my daughters version. However, many folks don't like any recipe without an abundance of yellow mustard. So mustard lovers... this is for you. Below is a slightly different Southern Potato Salad. Peel (or can leave unpeeled) potatoes. Cut into medium size cubes. Place in a saucepan. Cover well with water. Stir in salt. Place lid on pan. Bring to boil on medium heat. Reduce to low and simmer for 20 minutes or until of they reach the softness you prefer. While potatoes are cooking, mix rest of ingredients in a medium size mixing bowl, except the potatoes. Fold in chopped eggs and set aside in the refrigerator. When potatoes are done, drain and cool. Fold them into the dressing and egg mixture. The waxy type are preferred in making this Potato Salad Recipe. They are high in moisture content and low in starch which helps them retain their shape after cooking. That also helps eliminate the need for more dressings such as mayonnaise. Non-waxy types are called "mealy" potatoes. They are high in starch and low in moisture, making them dryer and mushy. They are an excellent choice for mashed or baked potatoes where additional moisture like butter, milk, and sour cream are added. Mealy types are best for frying and waxy ones are best for Hash Browns or Potato Pancakes. The most common waxy types are new potatoes, red or white skinned and the mature red skinned rounds. The most common mealy types are Idahos and Russets. If you are having trouble identifying which is which, ask your produce supplier. Save the Broth (from above drained potatoes) to help thicken and enhance homemade soups. Add it to condensed soups like Cream of Chicken and Cream of Mushroom for a quick snack. Potatoes are a good source of carbohydrates that supply energy, protein, calcium, phosphorus, iron, essential Vitamins A, B1, B2, C, niacin, and fiber plus nutrients in the eggs gives you powerful nutrition.